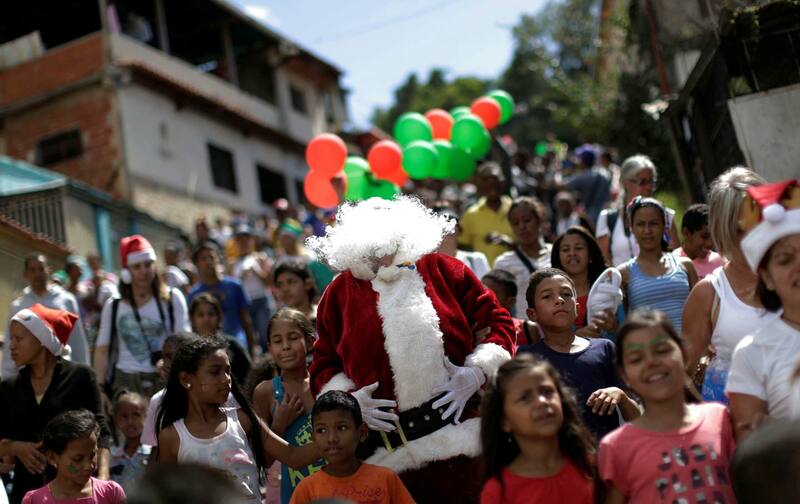 Christmas in Caracas? Worse Than the Grinch! Amid today’s crisis, what is salvageable from the Bolivarian Revolution? A conversation with Alejandro Velasco. Shortages are being reported on with glee in the US, the takeaway being that the failure of the revolution is inherent. Velasco, who is Venezuelan, just returned from Caracas. Below is a wide-ranging discussion, touching on questions of tactics, the limits and possibility of popular power, efforts to achieve food sovereignty, the relationship of the state to social movements, corruption, and what remains of Bolivarianism. Greg Grandin: You’ve just returned from Venezuela. What are your impressions? Yoga amid the ruins. What’s the cause of the crisis? What is the state of rank-and-file Chavismo? Your book, Barrio Rising, looked at the multi-decade history preceding Chávez’s coming to the presidency in 1998, looking especially at militant forms of popular, direct democracy in an impoverished, but militant and organized, urban barrio, 23 de Enero, that became a bastion of Chavista support (even if activists there wouldn’t primarily identify as Chavista). Is anything working? Is there anything salvageable from the Bolivarian Revolution? Were you there for the US election? OK, here’s the big question: What moral lesson does Venezuela provide? Gabe Hetland, in The Nation, has done excellent on-the-ground reporting pushing back on the dominant narrative that the current crisis is the inevitable result of socialism, looking at issues of sabotage, corruption, political missteps, and bad economic policy. But what’s your opinion? The crisis then seems sui generis, since most socialist movements can’t expect, if they achieve power, to be awash in petrodollars. I guess the question is, why couldn’t Chávez, in the short space of a decade, turn Venezuela into Norway?! But you’ve answered that in a way, by pointing out that he didn’t take power in a vacuum; rather, the possibilities of what he could achieve were determined by a sort of path dependency nearly a century in the making. So these are the potential seeds of a truly new form of social organization, something that might be defined not just in negative terms, in opposition to neoliberalism, but by what it is, a different way of organizing production and trade. Yes, but: As currency-exchange controls created more and more opportunities for graft and corruption through phony import schemes and large-scale arbitrage, comuneros encountered bureaucratic barriers that chafed against Chávez’s rhetoric in support of their efforts. By the time, in 2010, when Chávez pushed through a communes law to formalize their standing in his program, the commune project was a threat not just to the Chavista bureaucracy, which saw them as encroaching on their power, but especially to a new elite with deep interests in maintaining import schemes. Those have only gained in prominence as the crisis has deepened and as Maduro seeks powerful allies. Then there’s a difference of opinion here in terms of pace. There’s also an important common thread that goes beyond questions particular to Venezuela and its historic dependence on oil. Where the two meet is in their shared sense that popular power is central to revolutionary change, but if it is to be successful, if it is to fundamentally transform society in the interest of long-disenfranchised sectors, especially in the face of an organized opposition, it must begin from below, and it must be as comfortable outside as within the state.